Warts are common skin growths caused by HPV, or the human papillomavirus. The virus causes the cells on the outer layer of skin to grow rapidly, which produces the fleshy bumps known as warts. According to MayoClinic.com, warts usually disappear on their own without any treatment. Because they can cause embarrassment; however, many people choose to expedite the healing process by using over-the-counter and natural remedies. 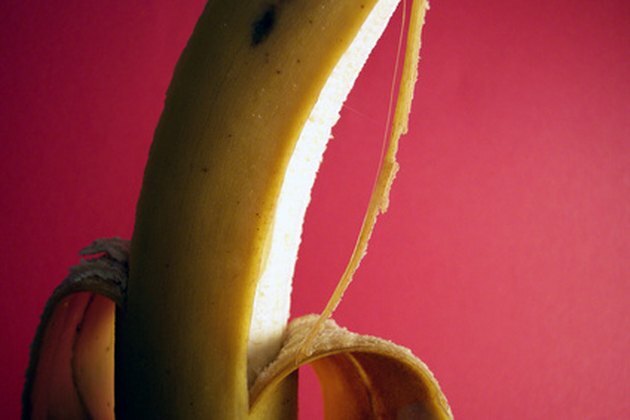 Banana peels, for example, are commonly used to help get rid of warts faster. The use of natural remedies is not supported by clinical research. Cut a small square out of a ripe banana peel with a sharp knife, about 1 to 2 inches wide and around the same height, or at least large enough to cover the wart. In her book “Natural Healing Wisdom and Know-How,” Amy Rost recommends using a brown or black banana peel for treating warts, although a yellow peel will also work. Place the tea tree oil directly onto the wart, if using. The University of Maryland Medical Center suggests using tea tree oil, a potent anti-fungal and anti-viral substance, to maximize the benefit of the banana peel wart treatment. Omit if you don't have the oil on hand, however, and the treatment will remain effective. Cover the area with the banana peel, placing the inner surface of the peel against the wart. Tape the peel in place using medical tape, leave on overnight, and remove in the morning. Repeat the treatment every night until the wart disappears, which may take as long as three weeks, depending on severity. Use thuja tincture, a common natural remedy for fungal and viral skin growths, instead of tea tree oil if desired. Leave the banana peel on the wart constantly, if desired, but change the dressing at least once every 24 hours. If you attend work or school, remove the peel during the day and reapply when you return home in the evening. At the very least, apply just before bedtime and remove first thing in the morning. The wart will turn black as it dies. Eventually, it will disappear and your skin will return to normal. Do not use a green banana peel. This wart treatment works best with ripe fruit, and green bananas have not yet ripened.